In 1888, Liberty Hyde Bailey had a big transition to make. He had accepted a new position, after just two and a half years of professorial life as Chair of the nation’s first Department of Horticulture and Landscape Gardening at State Agricultural College in Michigan (now Michigan State University), to become Professor of Horticulture at Cornell University, where he felt he would have more leeway to build an epicenter for the broad, interdisciplinary study of agriculture. But Cornell also had to do a bit of wooing, it seems, to get him away from Michigan, so to sweeten the pot they offered first to send him off to Europe during the fall semester to make a survey of agricultural practices there, bringing his wife Annette and daughter Sara along for part of the journey. He had never been overseas; just two years before he had left the country for the first time when crossing the Canadian border with Mamashgawab, an Ojibwe guide, by birch bark canoe in the Boundary Waters of northern Minnesota. Now he wanted to put his traveler’s itch to the test. This much you can learn in Philip Dorf’s biography of Bailey. In the Cornell archives, I recently encountered (by accident, looking for information about his farm Arbutus) the copious, narratively written journals that Bailey kept on that trip around Europe. They indicate that he had more than just botanical or agricultural interests in mind. This was the same year Bailey wrote up, from his 1886 field notes, a narrative account of his Boundary Waters excursion that he attempted to publish under the title Onamanni, which is the Ojibwe name for the lake that he spent the first leg of the trip traveling around. (I curated an exhibit based on this manuscript, held in Cornell’s Rare and Manuscript Collection, for the Liberty Hyde Bailey Museum, a description of which you can read under the “Former Exhibits” tab here.) Bailey’s favorite books growing up were travel narratives — an incredibly popular genre in the nineteenth century — and he wanted to write his own. The fact that he was still largely an unknown to the publishing world likely had something to do with the fact that Onamanni was never picked up; it was still years off that Macmillan would offer to accept for publication anything he wrote. But the idealistic thirty-year-old, with several published books already under his belt, was clearly thinking of reaching a wider audience through travel narrative, and I think it’s safe to say that he considered eventually publishing the two and a half full journals that he kept on his European trip (reworked, likely, as he did with Onamanni) as a book someday as well. Think Twain’s Innocents Abroad, but by a horticultural botanist/philosopher rather than a satirist. I have not read through the whole thing — it’s not my project, and there is simply too much else to do — but I stumbled today on a particularly moving passage about young Bailey’s trip to Stratford-upon-Avon. 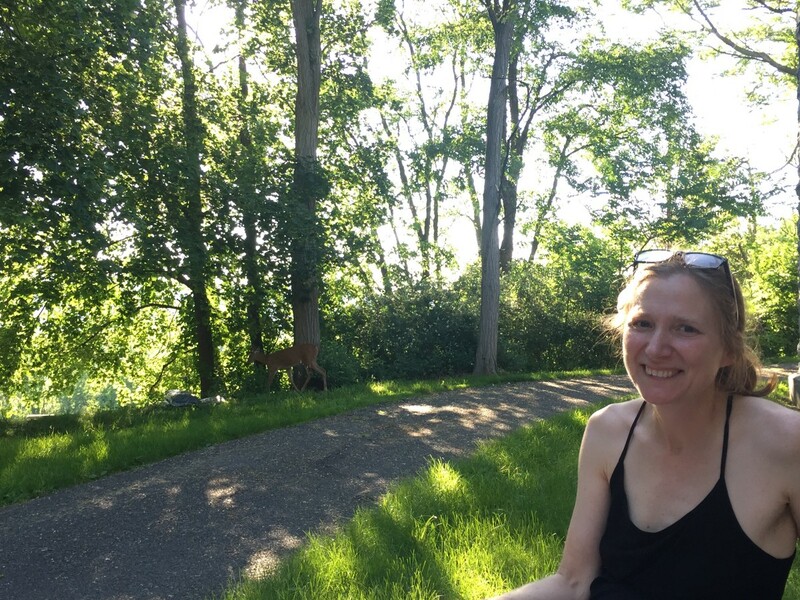 Amy Halloran, posing by a deer (middle left of picture), in front of the mausoleum where Bailey is interred at Lakeview Cemetery in Ithaca. Photo by author. As has so often been the case, I didn’t go in looking for this today. In fact, for the first time I was not alone in the archives. I had the pleasure of visiting with Amy Halloran, food/ag writer and author of The New Bread Basket, who is a fellow Bailey fanatic (a.k.a. Baileyateur) and who wanted to visit some Bailey sites around town with me and make a quick visit to the archives. In other words, part of the archival objective was just to pull cool things, given Amy’s brief time. So, while she read some of the farmer’s correspondence that I had found previously, I made a couple PDFs of longer documents using an app on my iPad so I could read them in depth later. But one of the cool things I pulled was the European journal, which we proceeded to flip through simply to gape over the sheer amount of virtually unread Bailey manuscript that, perhaps (we imagined), someday we would read. Amy spotted the mention of the word “poet” near the end of the first volume of the journal, so we stopped to check it out and proceeded to read Bailey’s entry of Monday, October 8, 1888. He began the day in the botanic gardens at Oxford (gardens he found “small but very compact and handsome [… that] have about them an air of great age”). Then he left at eleven by train and arrived around one in Stratford-upon-Avon, the childhood home, of course, of William Shakespeare. Old Billy Shakes. 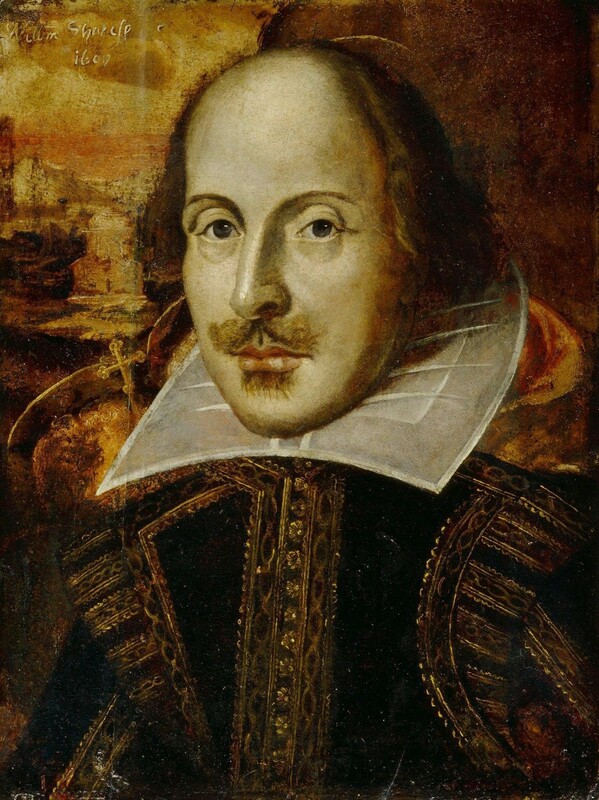 The Flower portrait of William Shakespeare (now a known nineteenth-century forgery), courtesy Wikimedia Commons, public domain. This excited stream of thoughts does not have a word crossed out or added in: a single draft. As we later discussed, Amy and I both felt chills for the same reason while reading this passage. Just the day before, we had stood in front of Bailey’s house at Sage Place in Ithaca, awkwardly admiring the bold but simple carved wood details around the wraparound porch of the craftsman-style brick house that Bailey designed, before mustering the courage to ring the doorbell and be let in by one of the nine members of Cornell’s undergrad rugby team who now rent rooms in the old building. For some context, see my intro post. To get in touch, use my website. Insights all gleaned from Liberty Hyde Bailey Papers, #21/2/3342, Division of Rare and Manuscript Collections, Cornell University Library.